We all know that finding the right products can be fairly complicated these days, as there are many options available. For example, it takes a significant amount of time to find amazing home decorations or car accessories for sale. The same goes for simpler yet important items such as umbrellas. There are many factors to consider when making this choice, such as usage, looks, and personal style. For this reason, we decided to make a selection and help you find the right product. For the Star Wars fans out there, we found this LED laser sword model. During a rainy night, you can become the main point of interest for those around you. If you want to keep the inner Jedi hidden, you can still use it as an ordinary umbrella. The 7 LED color options help you fit into any situation, while the umbrella itself protects you from rain, hail or snow. The flashlight option increases visibility, and the handle is designed to ensure full comfort during use or travels. The on/off button operates on battery and it’s safe to use in the rain. The inside-out reverse folding technology is what makes this model an excellent option, for both men and women. Its design ensures you can enter and exit cars or buildings without getting wet, as the inverted frame traps water droplets before they reach you. We all know what happens when it rains and it’s windy. The Repel umbrella provides a solution through its 8 double layered fiberglass ribs that offer exceptional wind resistance. The Teflon protective coating of the top layer means it dries with just a few shakes, while the collapsed umbrella stands on its own to protect the material from dirty floors. Featuring Repel’s unique reverse folding technology as well, this model suits you well if you’re a busy woman who just needs a reliable umbrella for everyday use. The fail-safe inversion technology protects the ribs from snapping during extremely high gusts of wind, by allowing the frame to invert. Besides the Teflon coating of the top layer, an additional layer added on the underside ensures that the ribs and other elements won’t rust. This model provides full protection, having a large 48” canopy. You can choose from a wide selection of colors and designs, and find the one that best suits you. If you know you travel a lot, especially to areas with bad weather conditions, then read further. Created as a professional grade umbrella, the Traveler FX Series is sturdily constructed and has an auto open/close mechanism that can be quickly operated. Its design features an upgraded 9-rib retractable frame, which delivers both strength for wind resistance and flexibility, leading to a highly portable item which can be taken anywhere. The manufacturer included its signature black micro-weave fabric into the 45” canopy. It’s also treated with Teflon waterproof for quick-drying and in terms of UV protection, it blocks over 98% of the sun’s light rays. This model delivers maximum coverage and see-through visibility with its clear bubble canopy design. The extended dome shape provides a high level of protection, while the curved handle ensures an easy grip for full comfort. This is an excellent option if you are living in a rainy urban area. It might not protect you from sun rays, but it sure does allow you to see everywhere around you, this way bringing a sense of security and reassurance. A fashionable item and an effective solution, the extended dome means you do not have to worry about your hair, face or glasses getting wet when it rains. This clear view bubble model comes with benefits, as well. The extended dome-shaped canopy provides full protection. For the mothers out there, this might be especially important if they need to carry their babies. You don’t have to worry about getting wet under the dome. The clear canopy offers full visibility, while colors of the design allow for a bit more privacy compared to the fully transparent models. The construction is sturdy, featuring a metallic crook handle, which makes it a reliable umbrella even on windy days. The manual opening system is easy to operate, as you just push the runner to open and pull to close it. If you are looking for something related to both the sun and rain departments, then we might have found the right model. Sun Tek’s extra large 68” arc canopy provides protection in any situation. The top’s silver coating reflects heat which, on hot summer days, makes it nice and cool underneath, while the fiberglass shaft, ribs, and the double canopy provide durability. The model’s Vortec venting system prevents the umbrella from inverting during powerful gusts of wind. Moreover, the extra large canopy can fit two people and the ergonomic handle provides a comfortable grip during use, but can also fit into most golf cart umbrella mounts. For all of you golfers out there who need full sun protection, Coolibar’s model reduces 98% of UVA and UVB. The umbrella is made of nylon and its silver finish design reflects the sun waves, making it nice and cool underneath. The 62” arc features a patented double-canopy design that also has a mesh insert, in order to provide optimal ventilation and stability. For full comfort during use, this model has an auto-open pinch-free mechanism and an ergonomically designed handle. The fiberglass frame, ribs and spreaders are corrosion-resistant and can resist gusts of 35mph, which means you will enjoy many carefree days in the sun. If you are a dog lover, or are looking for a gift for a friend who just can’t get enough of Cocker Spaniels, then we might have found exactly what you need. Before listing this model’s many features, let’s stop for a bit and talk about its “Oh my God, it’s so cute!” design. The cool navy blue canopy has small Cocker Spaniels silkscreened on each of the 8 panels. This model is an English classic stick style, with resistance given by the 8 fiberglass ribs and arms, as well as by the steel shaft. For usability, it has an auto open and easy close. Who said this manufacturer has only one awesome design? Take a look at this navy blue umbrella with little red Schnauzers silkscreened on each of the 8 panels. This model has the same English classic stick style and is optimized for ease of use with an auto open and easy close. Besides being useful, the design makes it a very nice item to take around and you might find out it can also become quite the conversation starter. Besides making an excellent gift, the high-quality 190T Pongee Polyester canopy provides very good protection, and the steel shaft and fiberglass ribs and arms ensure durability. Human’s needs have evolved significantly during the past few decades, especially in terms of fashion and services. This is why when looking for the best umbrellas, there are a lot more things to take into consideration now compared to two decades ago. While the Internet era has made it much easier to get information, it certainly is complicated to go through thousands of umbrellas reviews whenever you are looking for a new product. If you want to get a good umbrella for the money, it’s more than the price that you should pay attention to. Your general style should have a massive say in the way your accessories look. 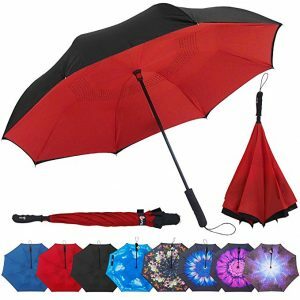 There are dozens of thousands of products for sale in the same product category, but this doesn’t mean that you can find the best lightweight umbrella after 5 minutes of browsing through different websites. It isn’t easier to find the product that best suits your needs if you are a man. 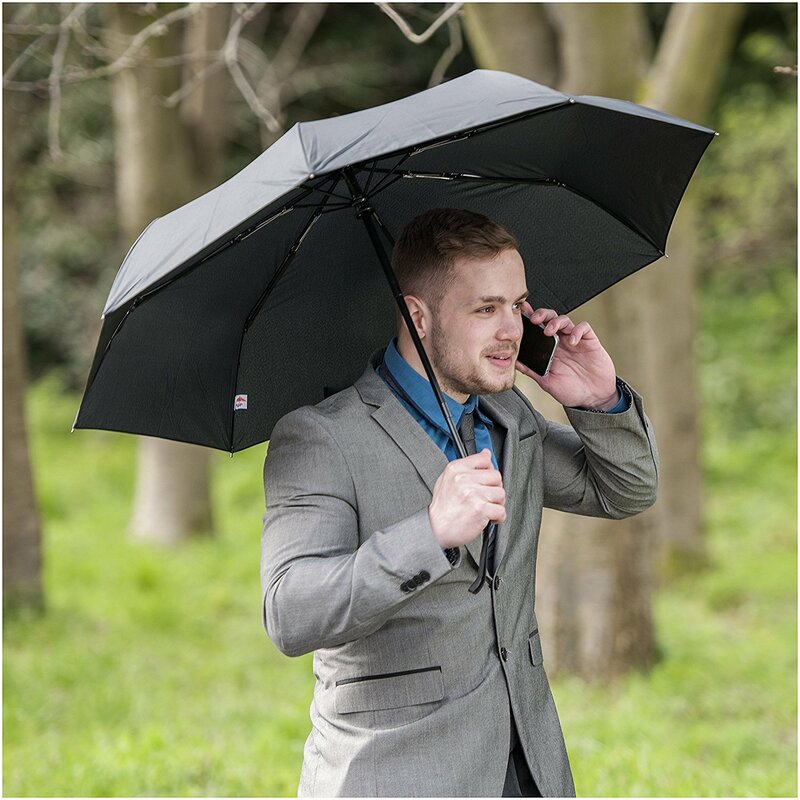 To make sure that you actually found the best men’s umbrella, you must first think of your fashion style. You wouldn’t want your new acquisition to be inappropriate or disruptive to your fashion style. And while you may believe that finding an accessory such as a new umbrella or a new umbrella stand should only take minutes, the truth is that, as fashion evolves, so do our standards, which makes it more difficult to fit an accessory to your ensemble. Finding the best product is never easy in a market that is overflowing with new products, qualitative brands that fight for new markets and people who care about the way those around them look like. This is why we’ve put together the following short guide to help you in this respect. Below, you will find some of the most important features you may want to look for in your quest for the best product for your needs. Depending on how much you plan on using your new accessory, you may be looking for different things. If you live in a geographic area where it rains most of the year, you should find something that is so comfortable that it won’t disturb you. Carrying something around constantly certainly makes that thing something of a burden, whether we’re talking about a laptop, a raincoat or just an umbrella. If you live in the kind of place where it rains the entire year round, the first thing you should take into consideration when buying an umbrella is its weight. Your comfort comes before any kind of social fashion pressure, so you should have in mind that you will probably have to take this object with you everywhere: to work, when you get your kids to school or to the theater on a Sunday evening. While this may not be a problem at first, you should think that repetition tends to make things annoying, especially the ones that we have to do out of necessity. But the weather is not the only factor that should matter when thinking of a new umbrella. Other things may also shape your final decision, such as whether you own a car or you have to walk around a lot. An umbrella that you only carry from your car to the building you are about to enter can be a little heavier and can be bought as a fashion statement rather than a bare functionality. However, if you don’t own a car and have to walk for 15 blocks to work every morning, you may want to buy something as little disruptive as possible. If you don’t live in one of those regions where it rains all the time, or you do but you also travel by car most of the times, you can think of other, more fashionable and less practical aspects of your purchase. For instance, one of the things that may matter – whether you are a man or a woman – can be the umbrella’s pattern. If you’re the kind of person who dresses in a lot of colors and has a happy and sunny wardrobe, you may be careful about the overall number of colors of your clothes and accessories, and maybe you should go for a plain, dark color. If on the contrary, you dress in a serious, sober fashion, but you also have a playful side that you want people to see, you can find a fun and colorful pattern for your new accessory. Some people cannot dress in a very colorful way because of the nature of their jobs, and they choose colorful accessories to liven up their appearance, such as colorful socks. If you are this kind of person, a nice, hippie umbrella may be just the way to make yourself loved at work and to make a pleasant appearance. Since you’re making this purchase for practical purposes, you may want to look at two different aspects that define a practical umbrella: canopy and handle. The canopy of a comfortable umbrella should be at least 10 inches in diameter. This way, you can make sure that your suit or coat won’t be soaking wet when you get to an important meeting. Next thing that may interest you is a vented canopy, which ensures that your umbrella won’t get inside out because of the powerful wind. Most of the people who are looking for a robust model consider a two-layer fabric, which contributes to a vented canopy and more protection and reliability. Additionally, you may also be interested in finding a product with a comfortable handle, especially if you plan on carrying that umbrella a lot with you. Because people are creatures of habit, it is necessary to invest in practical things, so that we can convince ourselves to use them without any discomfort. Depending on your generic fashion style, you may opt for a more sporty or a more elegant material. There is no right and wrong here, and your decision should be based on what makes you more comfortable. If you’re the kind of person who would love to walk around in training pants but is a lawyer, you may want to consider a more sober material, one that does not suggest that you’ve recently been to the mountains and took the wrong umbrella in the morning.